1. Knock off loose soot and grime from the inside of the firebox walls and flue. You can use a brush to gently sweep the walls of the firebox. Why not get some fresh firebox paint and spruce it up? 2. Sweep up all the ash with your fireplace tools and you can even get a brick cleaner for masonry style fireplaces. 3. Close the flue to prevent any drafts and to keep your firebox free from debris. 4. Decorate your fireplace with a beautiful fireplace glass door or screen and a new fireplace tool set. 5. In the event you really want a change and have a brick fireplace, take the time and check out your options. Matte finish brick color themed paint is an amazing way to totally change things before the cold months roll back around and you will be so glad you did. 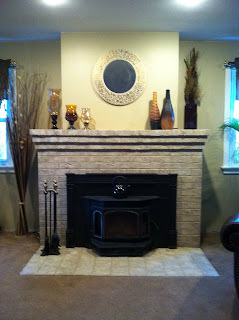 Your fireplace is beautiful way to express yourself and it can truly be a centerpiece in your home. So this spring, take the time and think and read about all your options and make your fireplace enjoyable all year round.